I had intentions of doing one of my lovely grid collages of the process of apple cider donuts I made on Saturday but the grid wasn’t working for me. Sometimes technology just fails to mesh well with creativity. Oh well. 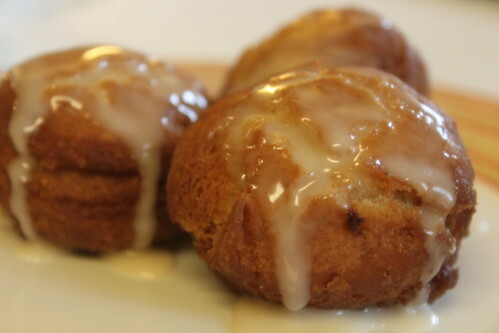 But the above picture of the apple cider donut holes is my favorite of the set. In case you were wondering why I make some of the things I make or look up recipes for these things, it’s usually based on what’s in my kitchen at the time and me not wanting to waste food. 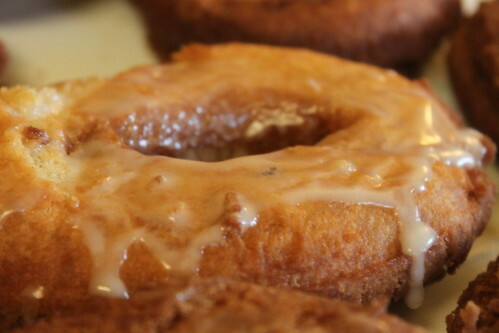 Prime example, I have apple cider and buttermilk in my kitchen…I don’t want to waste that so on Saturday morning I decided I wanted to make myself apple cider donuts. I don’t have a donut cutter (yes, those exist) so I used a large glass and a stemless champagne flute to cut the donut holes. Yes, I’m like the MacGyver of the kitchen. If I make these again, I would probably just make all donut holes. They came out lighter and I thought they were so much cuter than the donuts themselves. I merged this recipe from about 3 different ones I saw online, trying to figure out which one would give me the most apple cider taste. In the end, I would suggest that you cut up an apple and dice it and add it to the cider reduction, just to get a stronger flavor. Put the apple cider and chopped apple on the stove in the sauce pan at a medium high heat and reduce down for about 30 minutes. The liquid will reduce to more than half. Set it aside to cool. Whisk together all the dry ingredients in a bowl, set aside. Using a paddle attachment in your mixer, cream together the butter and sugar. Add the eggs and then add the buttermilk until they are combined. Add the cider reduction and mix. Pour in the dry ingredients in stages until you get a moist and slightly sticky dough. Lightly flour a baking sheet or cutting board (put some parchment paper down first) and roll it out to about a half an inch thickness, slightly more. I put my dough in the fridge for about 30 minutes to make it a bit firmer and easier to handle. Once you take it out of the fridge, heat up about 2 to 3 inches of oil in a dutch oven or pan while you’re prepping the donuts. Use a glass or donut cutter to cut out the shapes and transfer to another tray. Once the oil reaches 350 – 375 degrees you’re ready to drop them in. Don’t put too many in at a time, you’ll need to fry them for 30 to 60 seconds on each side (you’ll see them turn a lovely golden brown color). Transfer them to a plate lined with paper towels. 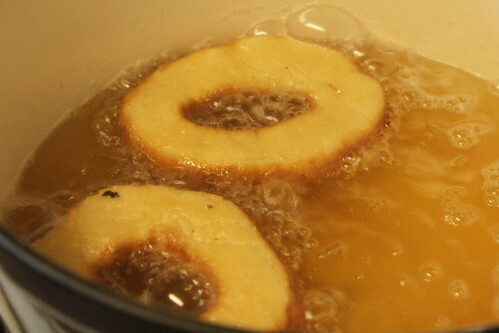 To make the glaze, whisk together the confection sugar and cider until the consistency is smooth. Drizzle over warm donuts/donut holes. ← What Is DWJ Up To?